There are a lot of things I love about Midgard. Whether it’s the beer domain clerics, Per-Bastet the City of Cats, the Kobold Ghetto in Zobeck, or the Margreve Forest, there are so so many brilliant aspects of the world that make me go “wow” and secure Midgard’s place as my hands-down favorite campaign setting. But when I try to nail it down to just one aspect of the world that really stands out for me, that makes Midgard what it is, I always say it’s their elves. The concept of elves comes from Norse mythology (the word in Old Norse for elf was álfr), and once upon a time, they were almost synonymous with the Vanir, the mysterious gods who at some point joined with the Aesir to become the Norse pantheon. In fact, the Norse god Freyr is actually lord of Alfheim (or “elf home”). So in some tales, the elves are just gods. Or maybe the Norse equivalent of angels. But they are divine beings, not “people” at all. But then other tales treat the elves as distinct spirits or demigods, separate from the Vanir (but not necessarily different from dwarves). Elves come in two varieties: light and dark. And this division is roughly synonymous with the Celtic ideas of the Seelie and Unseelie courts of the fairy. In fact, while the term “fairy” can often include a wide variety of creatures, including goblins and gnomes, the fae courts and their humanoid, elf-like denizens are most definitely influenced by the Norse ideas of elves and their divisions. And here comes Midgard, returning elves to a pre-Tolkien, Norse/Germanic-inspired role as fae or fae-like beings who are more capricious and inscrutable than Legolas or Thranduil ever were. In fact, in my own Midgard campaigns, I don’t even let my players play elves. I want to keep them at arm’s length, a mysterious “other,” at least until we’ve explored the world for a while. (That’s not a recommendation for your table, just my own preference). 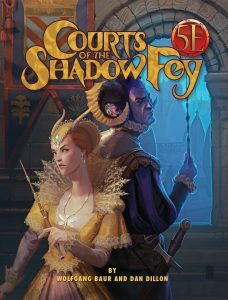 Enter Courts of the Shadow Fey, the one-hundred-forty-five-page hardcover adventure that takes characters from 7th to 10th level while sending them into the heart of the Shadow Realm and into the deadly politics of the Invisible Courts. Now the Shadow Fey are elves who have moved into the Shadow Realm and become altered by it. And they have Summer and Winter courts that alternate ruling. And a history with Family Stross. The adventure kicks off when the shadow fey decides to act upon a longstanding assumption that the ousting of Family Stross from the city of Zobeck negates ancient treaties. The shadow fey come to claim the city as their own, laying a most unusual siege to the City at the Crossroads. From there, the story is divided into four parts, which see the characters seek out the fey ambassador in Zobeck, find a way to travel into the Shadow Realm, enter the Courts of the Shadow Fey, and work their way up through the social hierarchy of this status-driven wonderland to a final confrontation with the king and/or queen. And it’s perfect. Courts of the Shadow Fey absolutely nails the capricious and otherworldly nature of these fey elves. They’re more likely to try to trade you for a memory or maybe an ability score than for gold or platinum. These elves are going to serve you something a lot more dangerous than Lembas bread—the old stipulations about not accepting food or drink while in the fairy lands hold true here. The adventure blends hints of Shakespeare’s A Midsummer Night’s Dream alongside scenes that tickle that very same nerve that the ballroom scene in Labyrinth does, while other, creepier parts of the adventure are perhaps more like something out of Pan’s Labyrinth. Oh, there are opportunities for combat aplenty but also the wooing of fey courtesans, dueling for honor, partaking in a magical hunt, dancing and dining at a very elaborate and unusual banquet, and always always the chance of a disastrous misstep at every turn that could prove deadly or just cost your character a precious point of status. The book itself is beautifully laid out, the information inside wondrously detailed, and every encounter has a guide for scaling the difficulty up or down from Medium to Hard (and often “Deadly” at a higher level). I’m personally going to run this as a follow up to Wrath of the River King (with whom it shares some characters). It will make for a fantastic campaign oscillating between urban adventures in the Free City of Zobeck and long story arcs in the Summer Lands and Shadow Realms. But I think the information herein could easily port into any setting, and given the sheer size of the book, this is something of the “adventure path” for Midgard that folks have been clamoring for. Personally, I cannot wait to run Act III, Scene 2, “The Courtesans’ Dance”. (I just hope I don’t give into the temptation to bump my players up levels too fast just so I can get there sooner rather than later!) Get the book. You’ll see what I mean.